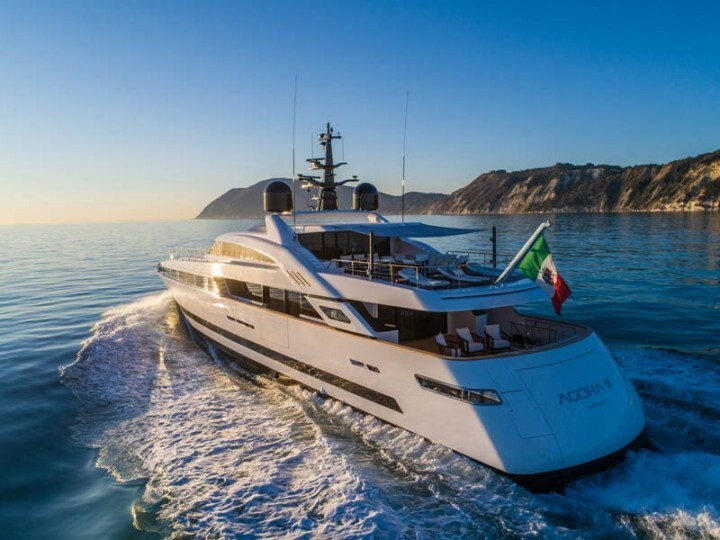 Interiors and exteriors have been skilfully designed by Luca Dini.Renamed "Agora III", the ISA 43-metre Alloy will be the largest private yacht in Japan. The design of the new ISA Yachts 43-metre with aluminum hull and superstructure stems from the stylistic search for clean, essential and streamlined external lines to enhance the sporty and at the same time elegant character of this yacht, combining past with present, innovation with tradition, in a sort of modern classicism. 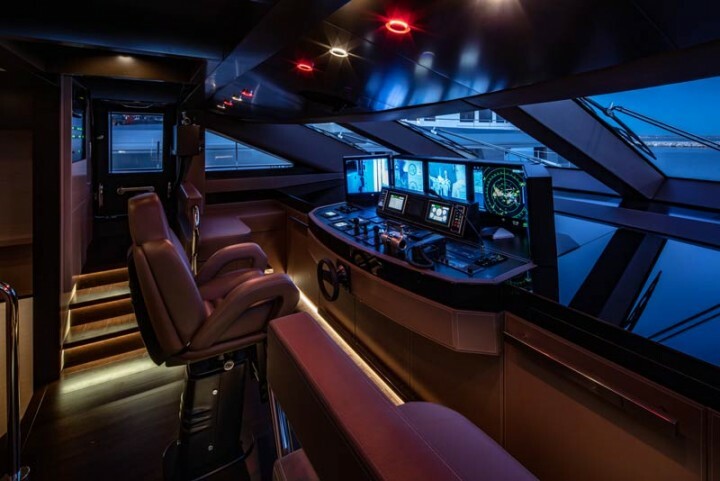 The naval architecture is by Francesco Rogantin, while the interior and exterior design is by Luca Dini. • the black tinted glass surfaces integrated into continuous bands and flowing as in the best tradition of Italian yacht design. The interior style, as well as the layout, have been designed with the aim of conferring a refined, elegant and personalized look. In this regard, the choice of materials falls on the most treasured raw materials such as precious stones, woods and silks. 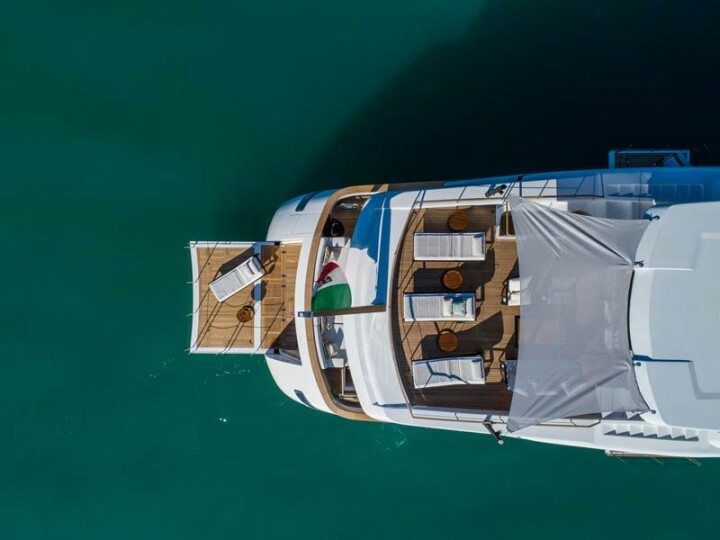 The interior spaces are designed to create a strong interaction between interior, outdoor spaces and the direct contact with the sea thanks to special fold-out balconiesnear the lounge area of the main deck, able to provide the most evocative views while comfortably sitting on the sofas. Between the lounge and the dining area, 5 column cupboards in dark wood act as a divider for these two rooms characterized by natural stones. The full-width owner's suite is located in the forward main deck together with the spacious bathroom and it includes also a relaxation area with of a comfortable sofa and a vanity on one side and a reading chair on the other. The master cabin can be reached from the main foyer through a first anteroom where we find access to the owner's dressing, an "office" and a "dormeuse" area connected to each other by sinuous and organic lines. 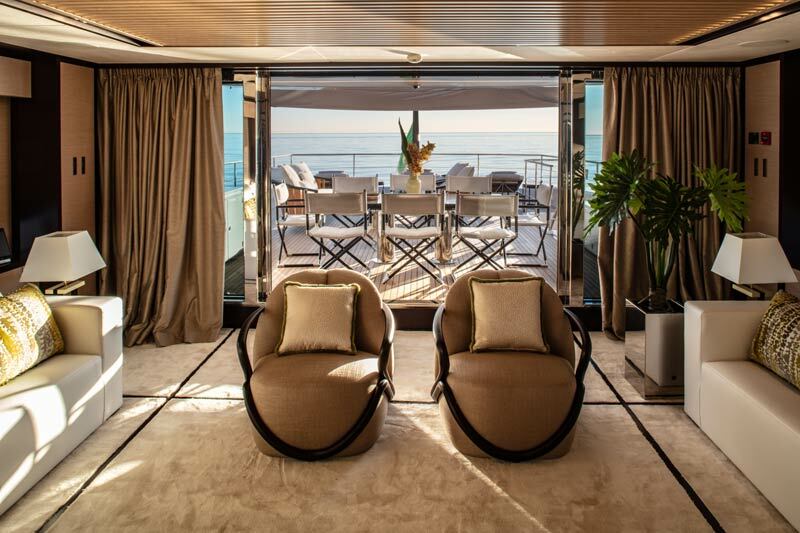 On the lower deck, instead, the transom door folds down to create a large beach club like afantastic balcony on the sea. A dressing room and a day toilet adjacent to the beach area allow guests to fully enjoy this space.